A day after the country's strongest typhoon for the year, so far, brought powerful winds and dumped heavy rain on this mainly agricultural province, many residents are already out and about, clearing tree branches and fixing damaged roofs. Evacuees at evacuation centers promptly packed up their things and started heading home, as well as some residents who checked into hotels just as a precaution. Shops reopened, and side streets were again filled with vendors selling fish, fruits, and flowers, among other things. All these scenes were observed by Kyodo News on Sunday from Tuguegarao City, the capital of Cagayan, up to the northern towns of Penablanca, Iguig, Amulung, Alcala, Gattaran, Lal-lo, Gonzaga, and Sta. Ana on the northeastern most tip of the main island of Luzon. "I will just have to rebuild my house, even just a small portion of it where I can keep some of my things and where I could sleep," Elizabeth Laguer, 68, said as she was preparing to leave the evacuation center in Sta. Ana town on Sunday around noon. 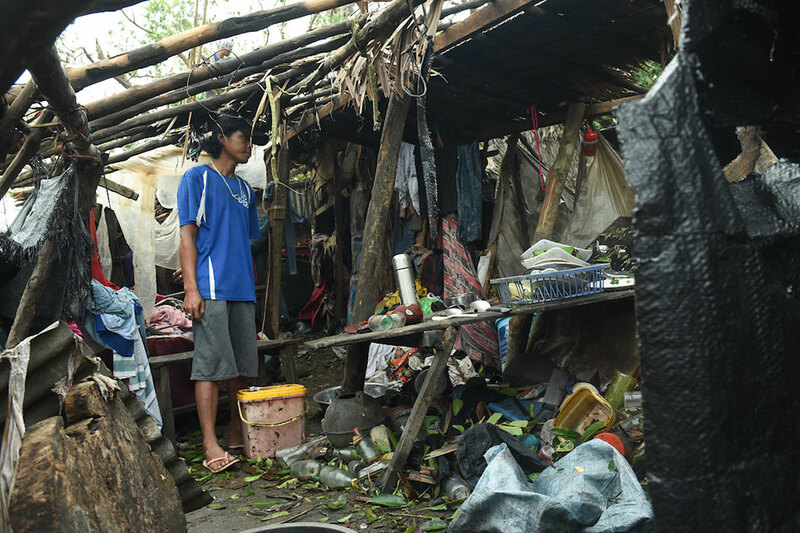 Laguer, along with her children and grandchildren, moved into the evacuation center on the eve of the typhoon's landfall Saturday on the advice of village officials who warned that her wooden house was vulnerable to the typhoon. Ompong (international name Mangkhut) packed winds of up to 205 kilometers per hour, with gusts that peaked to 330 kph, when its eye, following a westward track, crossed over the provinces of Cagayan, Apayao and Ilocos Norte. Laguer's house crumbled in the storm, the second time it happened to her. The first time, she recalls, was in the late 1980s when her children were still young. At the St. Peter Metropolitan Cathedral, the main Catholic church in Tuguegarao City, parish priest Bernie Corpuz acknowledged the high attendance as "not only because it's a Sunday, but more so because we are a grateful people, we want to thank God." "This is enough reason for us to come here, just to thank the Lord that we survived this typhoon," Corpuz said in his homily during the 5 p.m. Sunday mass, attended by thousands, including Cagayan Gov. Manuel Mamba. The Catholic priest reminded those present that "people should pray not for the storm not to come, but instead, for us to endure the storm together with God," because "storms in our lives are inevitable." Corpuz sought to inspire the people by assuring them of a bright future ahead after "journeying through the storms in life with their faith in God intact." Speaking to Kyodo News after the mass, Mamba said he feels challenged after the onslaught of Typhoon Manghkhut because of the scale of the devastation. "We have more to do for our people, and we need a lot of assistance from a lot of people also," he said. He pointed out that nearly two years ago, the province, which has a population of around 1.2 million, was hammered by Super Typhoon Haima. The typhoon left a total of 66 people dead in the Philippines, including four people in Cagayan. During Monday's flag-raising ceremony at the provincial capitol, Mamba lamented the six fatalities in the province, as well as the total destruction of about 154,000 hectares of farmland planted with rice, corn and vegetables. Together with fisheries and livestock, damage to agriculture in the province is estimated at 4.6 billion pesos (more than $85 million), he said. He said facilities that were restored after Haima again suffered damage, indicating the need for infrastructure with greater robustness. "Now, we have to recover. I want us to show that we are the first to clean up," the provincial head said. "We'll show our people that we here in the capitol are the first to recover." Affected farmers, he said, will be given vegetable seeds and garden tools so they can start planting again and expect harvests in two to three months' time. Meanwhile, public infrastructure that was damaged, including fallen electrical posts, a number of which blocked the national highway, are already being fixed by relevant agencies. Mamba said the recovery measures include documenting the experience of the province from Mangkhut. "All of these things are learning experience. And if we learn from these, we adjust, and then we become more resilient. And along the way, we also share our lessons." He reiterated his belief that Super Typhoon Haima and Typhoon Mangkhut are the new normal that has to be dealt with. "We may not be able to control nature, but we can manage its effects on us. So, let's coordinate, let's organize. Let's go back to work and buckle up," the governor said.